Boasting bright and modern interiors throughout, this outstanding two bedroom ground floor flat offers a large reception room with space to dine, smart fitted kitchen and a contemporary shower room. Hemingford Road is well positioned for a range of local schools and close to a range of shops, restaurants and transport links within North Cheam and Cheam Village. 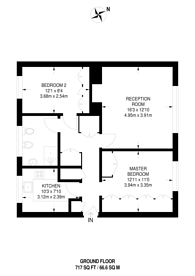 717 (66 Sq M) approx. How is the property market performing in SM3? We have over 1,000 property market reports for locations across London and Surrey - including SM3 and Cheam.